A few months ago when I awarded St Benoit with The Best Place To Dip Your Spoon in the 2nd Annual Independent food Festival, I hinted that they were developing a new flavour which I was lucky enough to get a sneak preview of. Had I not been given that complimentary sample, I don't think I would have ever tried St Benoit's Lemon Yoghurt because I consider myself much more of a plain yoghurt kind of girl. Additionally, lemon in yoghurt just sounds a little bit bizarre to me. And in reality it is bizarre. The mixture curdles and clumps, it has an almost mealy texture because of the fine traces of zest. 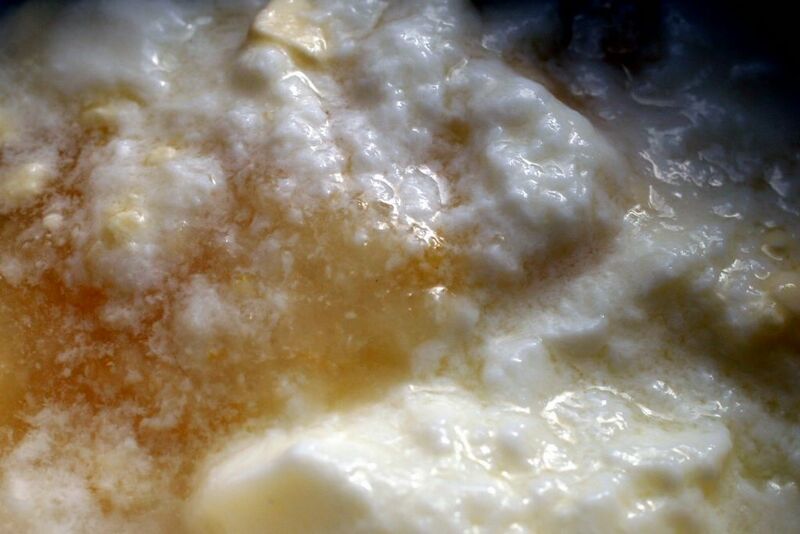 It clots, it curdles, it has liquid and pulp as well rich little nodules of cream on the surface. It almost looks ugly. But I tell you what... This is proof you should never judge a book by its cover. I absolutely love this lemon yoghurt, it is inexplicably good. The lemon is not too sweet or too tart. It's subtle and muted yet zingy and fresh. In fact, the flavour reminds me of Schweppes Bitter Lemon, a favourite European mixer soda that I don't seem to be able to find in the US. I love it. What else can I say? In compelling you to give it a try, perhaps I am asking you to take a blind leap of faith. If you are brave enough to jump I hope you feel as satisfied with this yoghurt as I do, when you come back down to earth. It is also divine with a handful of fresh blueberries or strawberries folded in. I just discovered this flavour and absolutely love it! Mmm, my grandma used to make something awfully like that! Sounds heavenly. I've been wanting to try St Benoit for a while, but Mollie Stone's in Marin is always sold out! Thanks for the link - I'll have to try Woodlands. I love lemon yogurt so I will be looking for this! Schweppes bitter lemon - a favorite of mine and a requirement for mixing an appropriate Pimm's Cup - is available at Beverages & More. They carry the small bottles in 6-pack form, at least in San Diego. I have been told, although it might not be correct, that the blend is only made a couple times a year for sale. When I see it I get 12 6-packs at a time. It is also very good for an upset tummy. Thanks for the tip on BevMo, Maureen! Where have you been? I've been eating this since late May when I first picked up the new Meyer Lemon one. It's my favorite flavor - Strawberry has fallen to second. I have a huge collection of those canisters they come in now. At least they're not as heavy as the Strauss milk bottles. i've been searching for that for months now in NYC, you'd think it would be easy to find... anyone have any hints? Marks and Spencer (here in the UK) used to do lemon yogurt, but they seem not to any more. It was lovely with savoury foods, especially fish dishes, or anything that needed cooling down a wee bit, like a curry or chilli. Is there any way to get St Benoit's in Los Angeles? I'm aching to try some!! Maureen - thanks for the Bevmo tip which i will certainly be checking out. Diane - let me know if you come across any, thanks! Bevmo usually has a good range of Brit chocolate but I cant say i ever checked for bitter lemon specifically. Jack - well I first tried it a long time ago when they were still developing the flavour, but tardy me took a bit of a while to get round to writing it up, that's all! I had to let you get your fill before everyone else started cottoning on to it, no? Ann - do you have Bevmo in NYC? Maybe online? Tokyoastrogirl - I could try and mail you some, maybe? do you think it would work?? Mary - you can get this at the farmers market in SF (Ferry Building). at the made in France sale you will find La Fermiere and les petits suisses which are both good too, though not as local, sustainable or artisinal as our beloved St Benoit. French though! the yoghurts sell out really fast! Lucky girl teasing with these yogurts. 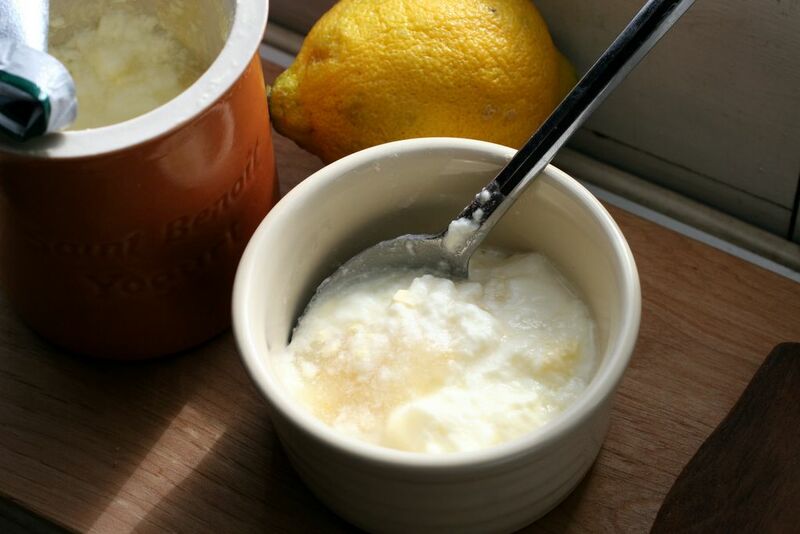 I have always loved lemon and yogurt, even when it curds! Sam- what a kind and generous offer. I don't want to put you through any trouble!!! I am actually planning visit my in-laws in Marin in less than 2 weeks so I think I will go in search of the yogurt. Thank you so much again- I'm constantly impressed with how kind, honest and passionate you are. After all, you're one of the most "famous" food bloggers out there but you're so down to earth and always so helpful. Anyway, just wanted to let you know what many people probably think! !